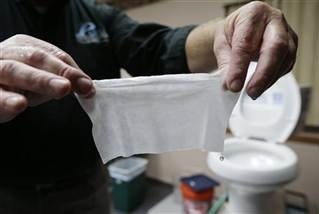 Office hours: Monday - Friday, 8:00 - 4:30 p.m.
Biodegradable or Disposable Wipes SHOULD NOT BE FLUSHED! Convenience wipes such as baby, hygienic, cleaning and disinfectant, as well as toilet bowl scrubbers and even paper towels might be labeled as “disposable or flushable”, but these items should NOT go down the drain. Products like these may very well flush out of your home, but they do not disintegrate or break down in the sewer systems, and are creating plugs in sewer pipes and the pumps that move sewage along, resulting in sewage backups, costly cleanups and repairs to equipment, and environmental consequences that can result in rate increases for both you and the Association. DO NOT FLUSH objects down the toilet such as wipes, diapers (baby or adult) feminine hygiene products or dental floss. Dispose of these items in your household or business trash receptacle. IF YOU HAVE SOMEONE WHO HELPS YOU CLEAN YOUR HOUSE OR BUSINESS, inform them of proper disposal methods for convenience products. SELECT CLEANING SUPPLIES THAT CAN BE WASHED AND RE-USED. · Baby wipes, disinfectant wipes, moist wipe, etc. BOTTOM LINE: Nothing should be flushed except toilet paper and human waste!